Despite President Trump's decision to withdraw from an international climate accord, other leaders affirmed their commitment to the plan at the G20 Summit. 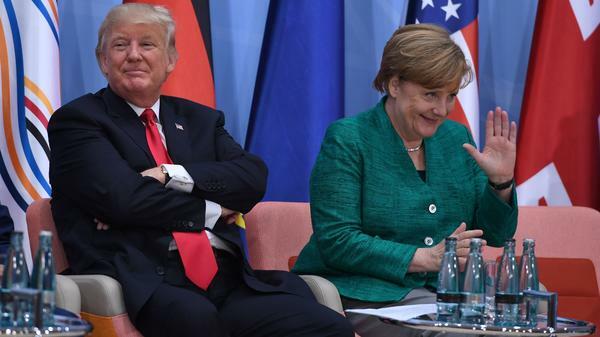 Trump is seen here with German Chancellor Angela Merkel on Saturday. The C40 network of some of the world's largest cities, whose leaders include former New York Mayor Michael Bloomberg, said in a tweet that its members "stand together with the G19 leaders" to uphold the climate accord. "We are ready to save the planet, and with the support of the G19 leaders our progress cannot be stopped," said Paris Mayor Anne Hidalgo, the current C40 chair. The term also showed up in headlines, from Der Spiegel to Politico and Buzzfeed. Sky News calls it "the G19 plus 1. America versus the rest." Noting Trump's decision to withdraw from the near-global climate agreement, the declaration says that the U.S. "will immediately cease" payments to an international fund to implement the plan. The U.S. had promised to send $3 billion to the Green Climate Fund; the stoppage comes after $1 billion was already paid under President Obama. Rather than participate in the Paris accord, the leaders' declaration states, the U.S. "will endeavor to work closely with other countries to help them access and use fossil fuels more cleanly and efficiently and help deploy renewable and other clean energy sources." Another agreed-upon document, the Climate and Energy Action Plan for Growth, notes the divide between the U.S. and its economic allies in the first footnote on the first word ("Preamble"). "The United States is currently in the process of reviewing many of its policies related to climate change and continues to reserve its position on this document and its contents," the footnote reads. By affirming their commitment to the Paris agreement, the G19 group fulfilled a key goal of German Chancellor Angela Merkel, the summit's host. Leading up to the two-day meetings in Hamburg, Merkel had said that climate change, terrorism and migration are issues that must be confronted with international unity. "Whoever believes that the problems of this world can be resolved with isolationism and protectionism, is sadly mistaken," Merkel said. Paris will host another round of climate discussions in December — two years after the initial accord was adopted, French President Emmanuel Macron said on Saturday.